For almost 30 years now, Salumaio d'Atene has been one of the most delicious and chic restaurant destinations in the city of Athens. Located in Kifissia, this family restaurant has always valued its customers, provided good service and had a top priority to retain their high quality food. The interiors of Salumaio make you feel like you're actually being in Rome or Milan. Round marble tables, a large deli section full of prosciutto, mortadella, other cuts and cheeses, and a beautiful patio, when the weather is good, to enjoy coffee, lunch or dinner. It's definitely my go-to place on a sunny Saturday for lunch or on a summer night for a romantic dinner. The menu is inspired by traditional Italian flavors and products. However, it always fluctuates among seasons as they strive to only provide dishes with fresh ingredients based on their seasonality. An "all time classic" dish and one of my favorite starters, is the Giovanna salad, i.e. 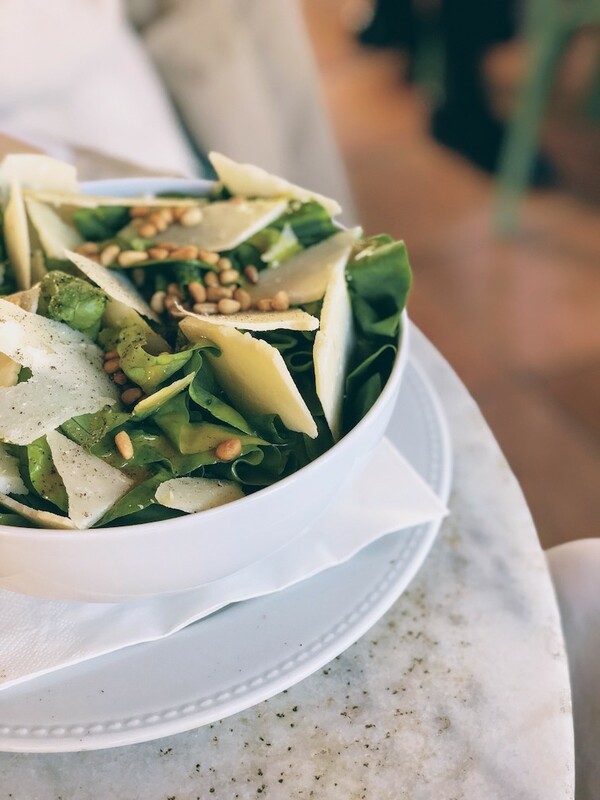 fresh green salad, parmesan cheese, pine nuts and garlic. Other great salad options are the Il Trovator and Il Cesare. On the appetizers side, the marinated sardines, are served on a piece of toasted bread with some tomato paste and you should try them. Same goes for the beef carpaccio and the gorgonzola omelette, which can even be ordered as a main course. There is a big selection of main courses, ranging from pasta & risotto, to meat and fresh fish. My favorite pasta dishes are linguini with wild mushrooms, orzo with crayfish, and crayfish tagliatelle with black truffle pearls and vermouth sauce. For all truffle lovers out there, the truffle risotto is delicious, as well as, the porcini risotto. Furthermore, during summer months the restaurant offers beef fillets with arugula and parmesan cheese, a very simple yet healthy and tasteful dish. While on the other hand, the fresh salmon dish served with kale and quinoa is always a good alternative, for those who can resist ordering some pasta. As for desserts, you should definitely try out the warm chocolate cake served with vanilla ice-cream, and the apple tart. During summer season, their pavlova with strawberries is the best choice to go for!